A couple of months ago I heard about Craft it Forward by Lisa Manuels. She was searching for five creative people she could send her own homemade stuff to. Each of these five people had to find another five people to send a homemade package to, and so on. Even though I was aching to do so, I didn’t reply at the time, and then life just moved on. But then I saw reintroduced’s quest for five people for Craft it Forward. This time (because regret is such an ugly thing) I immediately replied! Yes, I want to be part of Craft it Forward! 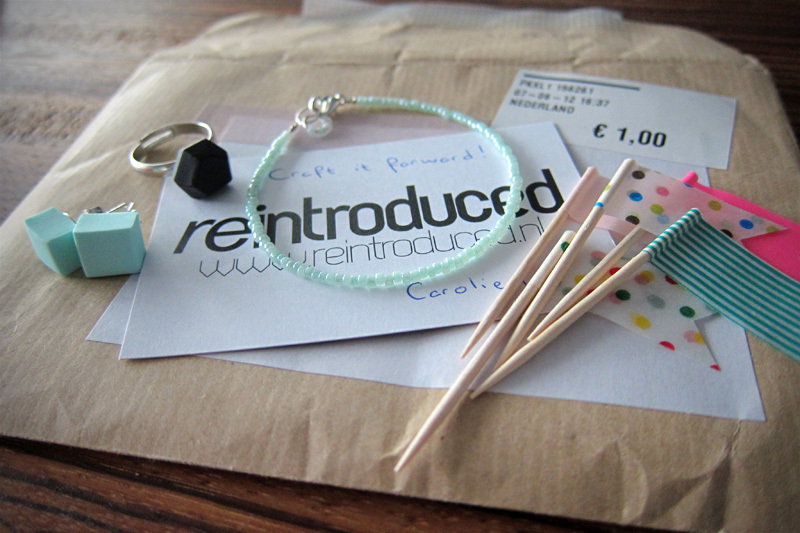 Oh and the reward was sweet… I’m quite a fan of Carolien, a designer based in Eindhoven. She makes the most beautiful and original jewellery, check out her Etsy shop! And the great thing is, the black ring she sent me, was actually on my wishlist! And those mint squared earrings and matching bracelets are beautiful too, I’m such a lucky girl. And check out the cute little flags made by maskingtape. How original is that? But the fun doesn’t end here! There are rules to follow, and so I’m looking for five people who want to receive a handmade package by me, and who then want to send out five packages themselves too. Do you want to play? Let me know in the commentform! Or you can send me a tweet of course. Let’s play Craft it Forward! So I can write down your name for Craft it Forward? Cool! Email me your address! Oh yes please – this sounds brilliant! Do you allow international people? I’m in the UK. Great! Mail me your postal address! And for everyone who wants to play too, sorry fully booked!